Over the past decade, programs have sprung up to teach kids and parents about healthful eating and physical activity. However, the home isn’t the only place where kids form their health habits. Roughly 75% of young children currently attend some type of day care or preschool where they consume up to three-quarters of their daily calories and nutrients.2 Addessi and colleagues reported in the December 2005 issue of Appetite that the preschool environment—including the type of foods served, the quality and duration of physical activity, and the examples set by teachers and administrators—has an important impact on children’s long-term lifestyle choices. Preschool nutrition and physical activity are becoming key issues in the fight against obesity. Once thought of as secondary to elementary, middle, and high school in terms of nutrition and physical education, preschool is now recognized as a critical time to instill healthful eating habits. Congress included provisions for better preschool nutrition in the Healthy, Hunger-Free Kids Act, passed in December 2010. And in June, First Lady Michelle Obama announced Let’s Move! Child Care, part of the larger Let’s Move! campaign that encourages children and families to adopt healthful lifestyles. Following this trend, some preschools have upgraded nutrition and physical activity in their facilities, and with regulatory changes on the way, more will follow. In the 2008 Feeding Infants and Toddlers Study (FITS), published in the Journal of the American Dietetic Association in December 2010, the diets of young children were reported as far from ideal. Preschool-age children consumed too much sodium, saturated fat, and added sugar and came up short on their consumption of fruits, vegetables, and whole grains. About one-third of 2-year-olds and about one-quarter of 3-year-olds consumed whole milk at least once per day, although guidelines recommended low-fat milk. About 85% of preschoolers consumed a sweetened beverage, a dessert, or a sweet or salty snack each day. Many researchers have tried to determine what proportion and quality of foods young children consume at home vs. at preschool. A few studies suggest that kids eat too many low-nutrient foods in both venues. One study, published by Bollella and colleagues in the Journal of the American College of Nutrition in 1999, looked at Head Start students’ total daily food intake, including food served at home, using 24-hour recalls that parents and guardians completed. The researchers found that participants consumed at least one-third of their calories at preschool and the remainder at home. The Bollella study was particularly reliable since it used dietary recalls rather than estimates derived from menu analyses. As noted in a December 2010 study by Neelon and colleagues in the Journal of the American Dietetic Association, foods on preschool menus are often substituted or changed at the time of service. Another study, which evaluated Head Start vs. non-Head Start preschoolers’ dietary intakes, showed that, broadly speaking, all preschoolers tended toward the same general dietary problems. However, Head Start preschoolers appeared to be at greater risk of low intakes of the Recommended Dietary Allowances for folate, vitamin A, vitamin E, calcium, iron, and potassium. The study, published in the Journal of the American Dietetic Association in July, indicated that children who didn’t attend preschool had the lowest risk of dietary deficits. The recommendation: All preschools should review their food offerings. One USDA report by Fox and colleagues, “Early Childhood and Child Care Study: Nutritional Assessment of the CACFP,” published in 1997, looked at meals and snacks provided to children aged 2 and older. The CACFP meal patterns reviewed showed saturated fat levels that exceeded national recommendations. Fruit, whether fresh, canned, or dried, was absent in many morning and afternoon snacks, and a very small percentage of snacks contained vegetables. Other notable studies have reported on CACFP-supported facilities. One study, by Briley and colleagues that was published in the Journal of Community Health in December 1993, looked at food served in CACFP-supported facilities in seven states, showing that fat and sodium levels along with the amount of fruits and vegetables and the variety of food provided, didn’t meet recommendations in the Dietary Guidelines for Americans. Another study, by Padget and Briley and published in the Journal of the American Dietetic Association in May 2005, compared the menus of nine child care facilities in Texas with the Food Guide Pyramid for Young Children. The results showed that the children at these centers consumed the recommended amounts of fruits and meat/alternatives but not enough vegetables, grains, or dairy. The federal guidelines on physical activity in preschools are broad and unspecific, with the express purpose of allowing for adaptation to center-specific needs. However, this lack of uniformity has made gathering data on physical activity at a “typical” preschool difficult. The American Academy of Pediatrics recommends that children older than the age of 2 participate in at least 60 minutes of moderate or vigorous physical activity on most or all days of the week. The National Association for Sport and Physical Education recommends 60 minutes of daily structured physical activity, broken into age-appropriate 15 to 20 minute intervals, as well as 60 minutes of daily informal physical activity. The Children’s Activity and Movement in Preschools Study by Brown and colleagues, published in the January/February 2009 issue of Child Development, demonstrated that even when preschoolers have physical activity planned into their day, children spend much of that time doing sedentary activities. The researchers observed that children enrolled in 24 South Carolina preschools engaged in moderate to vigorous activity during only 3.4% of the day, but that in preschools with better instruction and facilities, kids were more active. One study of 828,707 Head Start preschools nationwide, published by Whitaker and colleagues in the Archives of Pediatric and Adolescent Medicine in December 2009, showed that many preschools have taken the broad mandate and turned it into meaningful physical activity programs for young children. Eighty-nine percent of the preschools surveyed reported having an on-site outdoor play area. Seventy-four percent reported offering at least 30 minutes of adult-led structured gross motor activity each day, 73% offered unstructured gross motor activity each day, 56% reported having both of these in place. Because preschool licensing is done at the state level, states have the opportunity to impose and enforce health requirements with higher standards than federal regulations. State-level studies have provided unique insights into what private commercial preschools are doing to improve health and wellness since these facilities are studied less than CACFP-supported preschools. Most studies have shown that states have yet to strongly promote nutrition and physical activity, but some are beginning to use state-level regulations as springboards for improvement. One study on preschool licensing and obesity prevention, published in Preventing Chronic Disease in January 2009, reviewed state regulations for food and physical activity in preschools. The authors found that 29 states require this regulation for large facilities, 24 states require it for large home-based care, and 20 states require it for small family-based care. Most experts consider this to be a positive step since CACFP regulations form the basic foundation for preschool wellness. The study authors also found that around 60% of states regulate specific meal patterns for large child care centers but fewer regulate meal patterns for home-based care facilities. They also found that only two U.S. states, Michigan and West Virginia, require preschool and child care center menus to follow the Dietary Guidelines for Americans, which represent the gold standard of preschool nutrition. This research also revealed that although 36 states required children to have time to play outdoors each day, only nine of those set a minimum time for this. Ten states limited screen time, or the time that children spend watching TV and playing video games in at least one care setting. 1. Children have free access to water (41 states). 2. Sugar-sweetened beverages are limited (7 states). 3. Foods of low nutritional value are limited (9 states). 4. Children are not forced to eat (32 states). 5. Food is not used as a reward (10 states). 6. Support is provided for breast-feeding and the provision of breast milk (9 states). 7. Screen time is limited (17 states). 8. Physical activity is required daily (3 states). Facilities in Tennessee, Delaware, Georgia, Indiana, and Nevada followed most of these regulations. However, some child health advocates are concerned that without inspection and enforcement, regulations will do little to benefit preschool-aged children. Benjamin and colleagues found that 29 states inspect child care centers once per year, 16 states inspect twice per year, and six states inspect three times or more per year. Inspections are less frequent in smaller centers, such as family-run child care homes. Recent preschool obesity prevention trials have shown that interventions using innovative curricula and regular, structured nutrition education for students and teachers, as well as offering healthful foods, can impact preschoolers’ weight and food choices. One study’s findings, presented at the American Heart Association's Conference on Nutrition, Physical Activity and Metabolism, recruited families with preschool children to participate in a school- and home-based study. The school-based portion provided menu and educational modifications, including serving water as the primary beverage, limiting sweetened beverages, and serving fruits and vegetables as snacks. Additionally, teachers received weekly lessons on nutrition and physical activity and the cognitive, cultural, and environmental barriers to eating a healthful diet. The family education portion of the program included monthly parent dinners to educate them on food labels, portion sizes, and cooking tips; healthful fast-food choices; and at-home activities such as sampling new foods and drinking lower-fat milk. At the end of the one-year study, 73% of the children were at normal weight as opposed to 68.4% at baseline. The intervention group children also ate less junk food and more fruits and vegetables and drank more 1% milk. A journal article discussing the intervention outcomes is under review at Preventive Medicine. Another study, which is currently under way, will compare the impact of a 14-week teacher-delivered weight control intervention vs. a 14-week teacher-delivered general health control intervention on BMI, television viewing, healthful food intake, and teacher attitudes. The study was designed by Marian Fitzgibbon, PhD, who studied “Hip Hop to Health” in the first efficacy trial of a curriculum to document changes in BMI among minority children. Some Head Start and other preschool programs use a curriculum to teach nutrition, physical activity, and even skills such as gardening and cooking. “Eat Well Play Hard,” created by Team Nutrition and available on the USDA website, is a popular national lesson plan. However, numerous private preschools use commercial or in-house curricula. Social marketing is another approach to reaching children and their families. 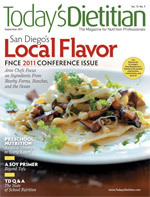 “Food Friends,” created by Young and colleagues and reviewed in the Journal of Nutrition Education and Behavior in the September-October 2004 issue, reported that the parents of children exposed to nutrition tips understood the program’s healthy eating messages and showed self-efficacy and intent to employ them. Although changes in preschool nutrition and activity seem to be moving in the right direction, barriers to preschool obesity prevention still exist. Teachers who worked with Hughes and colleagues, who published a study on such barriers in Health Affairs in March 2010, cited several major challenges. Some of these included time, money, and knowledge about good nutrition and exercise, different cultural or religious beliefs between staff and parents, and the fact that some children start preschool already overweight. The Rudd Center at Yale University, in its Fall 2010 paper “Strategies to Prevent Overweight and Obesity,” recommends that, in addition to improving food and ramping up physical activity, all preschools should create and follow wellness policies that include healthful meals and behaviors. The center also stresses the importance of decreasing the number of junk food advertisements targeting preschool-age children. 1. Ogden CL, Carroll MD, Curtin LR, Lamb MM, Flegal KM. Prevalence of high body mass index in U.S. children and adolescents, 2007-2008. JAMA. 2010;303(3):242-249. 2. Ogden CL, Carroll MD, Flegal KM. High body mass index for age among U.S. children and adolescents, 2003-2006. JAMA. 2008;299(20):2401-2405. 3. USDA Food and Nutrition Service. Child & adult care food program. Updated June 10, 2011. Available at: http://www.fns.usda.gov/cnd/care. Accessed May 29, 2011. — Source: USDA Food and Nutrition Service. Child & Adult Food Care Program meal patterns. Available at: www.fns.usda.gov/cnd/care/programbasics/meals/meal_patterns.htm. Accessed June 12, 2011. • Local WIC agencies that serve the same child population as CACFP can share materials at no cost to either agency. Must have written agreements. • Simplification of eligibility forms for all children, including foster children. • Flexibility to maximize reimbursements by allowing the use of high school and middle school data to qualify families. • Can now serve after school meals as well as snacks. • Launches a study of the nutrition and wellness practices in child care settings to be conducted every five years by the USDA and Health and Human Services. • Allow only lower-fat milk options to be served to children over the age of 2. • Water must be made accessible to children throughout the school day. • USDA will issue policy. • USDA will issue guidance to state agencies on increasing the consumption of fruits and vegetables, whole grains, and lean proteins. •Guidance must be issued prior to January 2012. • USDA must revise CACFP meal pattern to be consistent with the U.S. Dietary Guidelines. • Regulations must be proposed for public comment by June 2012. • Final regulations expected in 2013. *All changes contingent on congressional authorization to use the currently allotted $10 million for these program changes.